• To promote and propagate the teachings of our Lord, Jesus Christ, and the welfare of the Orthodox faith. • To strengthen the Antiochian Orthodox Christian Archdiocese as a spiritual, administrative and functional entity. • To financially support the Antiochian Orthodox Christian Archdiocese through a lifetime commitment. • To enhance the spiritual commitment of its members. The new membership goal for The Order, set by Metropolitan PHILIP, is 2500 members by the 25th anniversary in 2001. We have already accomplished our previous goal of 2000 members by the year 2000! Metropolitan PHILIP saw the need to study the possibilities of a new organization that would challenge the laity of our Archdiocese to be true disciples of Christ and enter a new dimension of service. A small committee was organized under the chairmanship of Albert Joseph. The committee was composed of Ernest Saykaly, Robert Andrews, Robert Laham, Theodore Mackoul, Archpriest Paul Schneirla and Archpriest Antony Gabriel. During the Archdiocese Convention held in Louisville in July 1975, a preliminary report was filed at the General Assembly. The Metropolitan Primate accepted the findings of the report and, by the Archdiocese Convention held in 1976 in San Francisco, the provisional chairman was installed and the first induction to the Order took place. It was during the Patriarch's historic trip that the newest Archdiocesan organization was called into being and given his apostolic blessings. The first officers and chaplain were formally installed and many new members were inducted at the Washington Archdiocesan conclave in 1977. 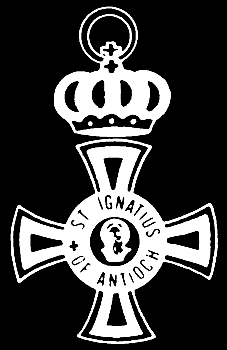 Ever since His Beatitude, Patriarch ELIAS IV, of Thrice Blessed Memory, and our beloved Primate, Metropolitan PHILIP, formally blessed and inaugurated the Order of St. Ignatius of Antioch, an unprecedented number of lay persons were awakened to their local Archdiocesan responsibilities and scores of earnest men and women have come forward to join the Order. An event that marked a turning point for the Order was its First Grand Assembly held in October 1978 in Florida. The business of the Order that was conducted, the religious and educational experience and the fellowship shared firmly knitted together the members of the Order. From a handful of dedicated and devote men and women, the Order has grown to over 2300 members and continues to grow weekly. The goal for the Order of "2000 by 2000" has been met and our beloved Metropolitan has now challenged The Order to attain 2500 members by our 25th anniversary in 2001. This is certainly attainable since the projects of the Order continue to attract Antiochian Orthodox Christians to membership. some are executives, some work in the shop, some in the hospital, some in the factories, some in the home, some are young, some are seniors, some have young children, some have old grandchildren. All share a common love for Christ and His Church. All share a common belief that through the Order, we collectively assist our Archdiocese in performing Christ's work. In doing this work and being guided by our beloved Primate Metropolitan PHILIP, we follow the words of St. Ignatius when we "do nothing apart from the Bishop." By the Grace of God the growth of the Order has enabled the Order to contribute almost ten million dollars, since its inception, to projects of our Archdiocese. The annual budget now exceeds $1,000,000. The Order has contributed to Archdiocesan departments and projects such as Missions and Evangelism, Youth Ministry, Campus Ministry, Camp Scholarships, Antiochian Village, Heritage Museum and Learning Center, Prison Ministry, Education, and the Clergy Benefits Fund. Equally important, the Order, guided by our Metropolitan, has responded to special needs outside our Archdiocese such as Special Olympics, Project Mexico, Lebanon Relief, Mexico Earthquake Relief, Montreal Ladies Aid Society, Holy Trinity Orthodox Nursing Home, the Task Force on Jerusalem and International Orthodox Christian Charities to name a few. Thanks be to God for His continued blessings upon this Order. May we always serve His Holy Church in a way well pleasing to Him.